Our adventure starts in Dahab. On the 1,5 hour drive to Saint Catherine’s Monastery we will also be passing the “Wadi Ghazalla”. Our ascent to Moses' Mountain begins directly behind the monastery. 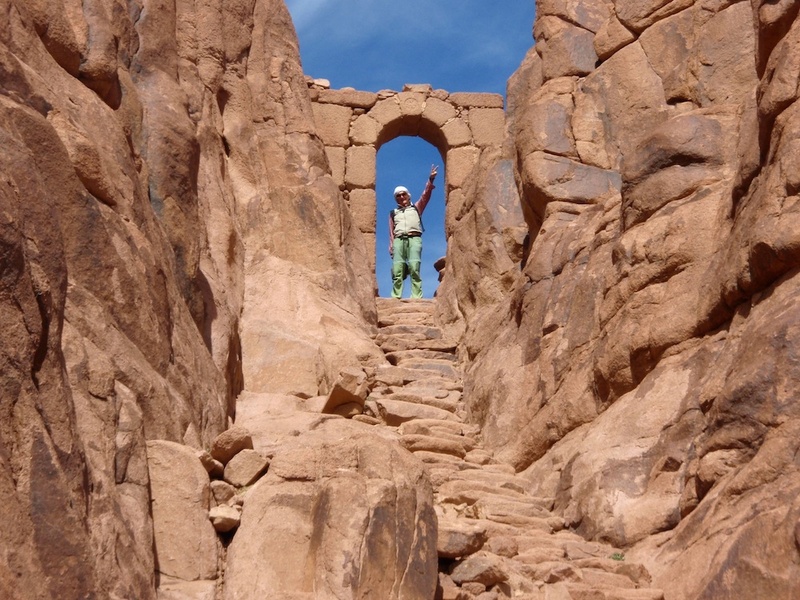 You can then choose between climbing to the top by foot or riding on camel’s back, if you preferred the more comfortable way. Either way it will take around 2,5 hours and we can unfortunately not spare you the final 350 steps, which must be walked in any case! As soon as we have finished our recreational break on the mountain top where we will not only be able to enjoy the beautiful panoramic view almost always by ourselves but also be serving a little snack we have brought with us, our descend to “Wadi Arbain” with its olive grove begins. Although this path is relatively unknown you will nevertheless be impressed by the spectacular landscape here. We will also be passing the starting point of the hike to Mount Catherine, where our friend Ramadan, a local Bedouin, will invite us in for tea. After joining him for a cup we will continue our way back to the village of Saint Catherin, which will take us another hour. At sunset we will be driving back to Dahab again. 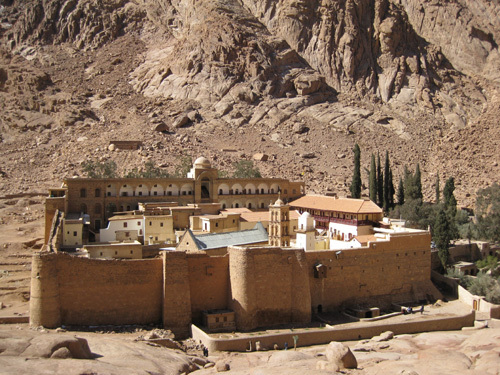 Saint Catherine’s Monastery lies at 1585 meters. This nowadays Greek-Orthodox convent was founded between 548 and 565 and is thus one of the oldest Christian monasteries still occupied. According to the tradition, it was built on the exact location where God revealed himself to Moses in the burning bush. Furthermore, it is also said to be the resting place of Saint Catherine of Alexandria’s bones, which have been brought here by angels. This is the starting point of the 2,5 hour tour to the top of Moses’ Mountain. A long time ago, a monk built the 3600 steps to the top of Moses’ Mountain out of the rock. Those are the steps that now have to be conquered by visitors in order to get to the summit. 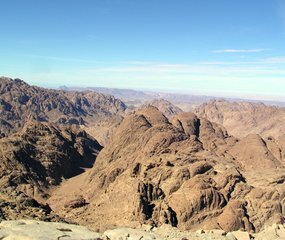 The exhausting climb will be rewarded by a fascinating view over the whole Sinai Peninsula. 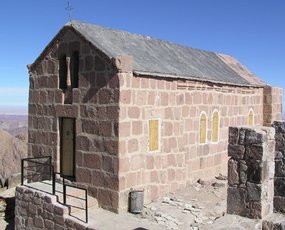 The chapel that has been built in honor of Saint Catherine is located at the top of Moses' Mountain called “Gebel Musa” at an altitude of 2285 meters. will be rewarded by a wonderful overview over the Sinai.